In the present competitive business age everybody wish to choose a system that suits his business processes. Integrated systems are the systems that help in integrating key business and management functions. They provide a high-level view of all the activities that are going on in the business. In the earlier days, data used to be collected from different nodes and then compiled in the form of a summary report. All these processes were too time consuming. Presently the software does this compilation or integration work. There are many packages that integrate the activities of different business divisions and thus allow the businesses to devote more time on productive things. However there are different needs of different business and one should be careful in deciding about software that would be useful to him. Any company looks for these packages to integrate its corporate functions like finance, manufacturing and human resources. This is a critical activity. As a budding manager you should be able to understand the system requirement of your company. You should be able to define the information flow, information requirements and information usage so that you gain competitive edge. Literal meaning of “Integration” is combination or amalgamation. In terms of computer terminology, “Integration” is a broad term for any software that serves to join together or act as a go-between between two separate and usually already existing applications. Integrated software applications for business gives you the ability to integrate the diverse information sources pertaining to your business into a single framework. This integrated information can then be shared by applications such as Customer Relationship Management (CRM), Supply Chain Management (SCM) and Business Process Re-engineering (BPR) systems. ERP: Short for Enterprise Resource Planning, a business management system that integrates all facets of the business, including planning, manufacturing, sales, and marketing. As the ERP methodology has become more popular, software applications have emerged to help business managers implement ERP in business activities such as inventory control, order tracking, customer service, finance and human resources. CRM: Short for Customer Relationship Management. CRM entails all aspects of interaction a company has with its customer, whether it be sales or service related. Computerization has changed the way companies are approaching their CRM strategies because it has also changed consumer-buying behavior. With each new advance in technology, especially the proliferation of self-service channels like the Web and WAP phones, more of the relationship is being managed electronically. Organizations are therefore looking for ways to personalize online experiences (a process also referred to as mass customization) through tools such as help-desk software, e-mail organizers and Web development applications. SCM: Short for Supply Chain Management, the control of the supply chain as a process from supplier to manufacturer to wholesaler to retailer to consumer. Supply chain management does not involve only the movement of a physical product (such as a microchip) through the chain but also any data that goes along with the product (such as order status information, payment schedules, and ownership titles) and the actual entities that handle the product from stage to stage of the supply chain. There are essentially three goals of SCM: to reduce inventory, to increase the speed of transactions with real-time data exchange, and to increase revenue by satisfying customer demands more efficiently. In computing, SCM typically is used in reference to software applications that enable more efficient management of the supply chain. BPR: Short for Business Process Re-engineering. It is aimed to make radical changes in an organization from the ground up in an aim to improve performance and make more efficient use of resources. The concept of BPR generally includes the use of computers and information technology to organize data, project trends, etc. Many big companies are giving high importance to software integration. Today nobody wants to access data stored in multiple systems. They want to build strong links between business systems and make information flow better. Let us take an example, suppose you want to place an order through the net. 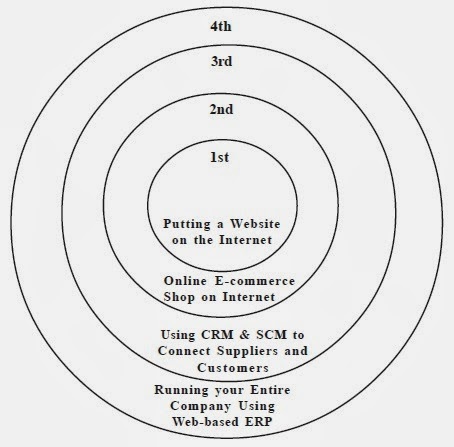 An integrated software solution will, on one hand, take that order, shift it and allocate them to the manufacturing plant and on the other hand place order for the raw materials on the basis of the stock, update the financial position of the company with respect to suppliers and the inventory and so on. Many people have given different names to the integration of ERP, SCM, BPR and CRM. These names include e-business, c-business, m-business and KM etc. There are many software that do these integration activities. To name a few there are software known as Baan, Fourth Shift, Frida, JD Edwards One World, Manage 2000, Masterpiece - MP/Net, Micro strategy, Oracle e-Business Suite, People Soft and SAP R/3. There is a lot of interest among IT solution providers about packages that help in ERP, SCM, BPR and CRM. The plea given is that they help in real business growth. Companies actually want to integrate their diverse business processes to simplify operations for faster decision-making. Many companies have realized that if they have to survive and grow, they have to use tools that can provide quicker and useful information and cut costs to increase efficiency. Till now IT was used in large and multinational companies only. Small companies were not willing to invest more on IT. In India, on an average, small and medium companies were reluctant to invest more than 2-5% on IT. Circumstances have changed now. Businesses are not trying really hard to reap the benefits of IT for gaining competitive advantages. IT has given businesses a chance to generate information in real-time and thus grab opportunities that were non-existent or unseen earlier. With the development of cutting-edge technology, we have seen evolution of many systems that has adapted market demands. IT is readily providing business solutions now. These solutions provides a platform to integrate all processes in an organization enabling it to plan, trace and see its 4-m resources (materials, machines, men and money) in the best possible ways to service customers and reduce costs. If you want that your Business should survive with low overheads and still run efficiently then you have no choice but to opt for IT solutions. A typical business solution is an integration of ERP, BPR, SCM and SCM. While ERP can take care of functions like accounts production planning, payroll and marketing etc., BPR can be used simultaneously to cut-down on all non-value added business processes and paperwork. These systems are the enablers of change in the business for better. With the help of these systems your business can compete better. These systems if combined with the web help you to reach your customers most cost-effectively. There would be no cost incurred on travel and communication and no cost incurred on setting up offices and employees. The key to establishing a good IT system lies in the proper planning. Businesses should first specify their needs, processes and key data. They should clearly specify the kind of information and its flow. Once these specifications are done, it is the integration of information that is required. Once integration is done, information is accessible to every department around the company.